A grandparent's love knows no bounds, and Bob Facca is proof. 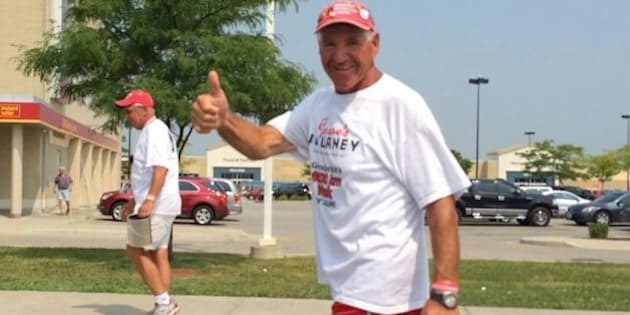 Facca has been walking across Quebec and Ontario on a trek to Winnipeg, in an effort to raise money for his seven-year-old grandson, Louie Facca, according to Global News. Louie was diagnosed with Duchenne muscular dystrophy, a disease that causes muscular degeneration and affects one in 4,000 boys. The 65-year-old grandfather has been walking since May, and is set to finish his journey later this month. “As a grandparent, and all grandparents are the same, they just want to find a cure because we’d do anything we can do for our grand kids,” Facca told Global News. So far, he's raised about $700,000 with the help Jesse's Journey, a charity that raises money for the muscular disease. While the 4,000-km journey is a big undertaking, this isn't the first time the London, Ont. native has trekked for the disease. According to The Londoner, Facca walked from Owen Sound, Ont. to London, Ont. two years ago. Following his first journey, Facca walked five km several times a week in order to prepare for this longer journey. Now, he walks 20 km a day. Facca told The London Free Press that Louie, who was diagnosed with the disease two years ago, was a catalyst for his charity work, but John Davidson is his inspiration. Davidson is the owner of Jesse's Journey, which he created in honour of his son who suffered from the same disease and died in 2009. In 1995, Davidson pushed his 15-year-old wheelchair-ridden son across Ontario, raising $1.5 million. Since then, the charity has raised $5 million for research across North America, according to its website. To donate to Facca's journey and Duchenne muscular dystrophy, click here.